Monday, January 14, 2019: Up, to cold temperatures! These are Maine temps…yikes, need to head further south! Kit and I had breakfast and started breaking camp. And “breaking” is the operative word…it seems our fancy-schmancy electronic leveling jack system decided to join the Feds and declare a shutdown!?!? So, with only an hour to checkout time, and with someone expecting to occupy the site we are now stuck to, a SNAFU (It’s a legit word, look it up!) has developed. Calling the MWR (Morale, Welfare, and Recreation) folks and explaining my dilemma they reassigned the incoming camper to another site and gave us an extension. 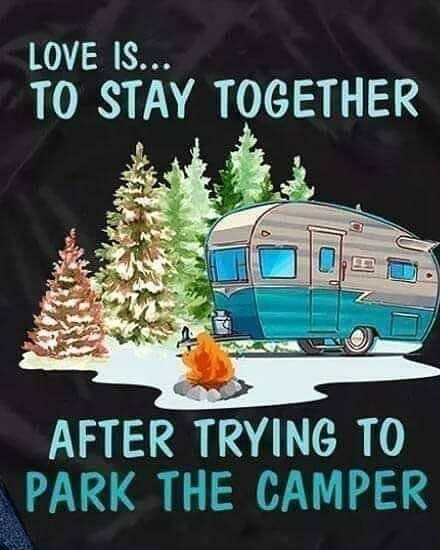 So, with that reprieve it was troubleshooting time…however, before we get into all that a bit of RV humor to lighten the mood! And, a warning…the next two paragraphs are a bit wordy, what Kit calls: “Blah, blah, blah”. So…if this kinda stuff hurts your brain, feel free to jump ahead to Wednesday. I was successful in using the emergency crank handle to lift the camper, move the truck under, and slowly retract the front jacks to safely latch truck to trailer. Now, at least if we must move it is doable…however, the two rear leveling jacks are more difficult to retract manually and were still extended and too close to the ground to comfortably move the camper very far. 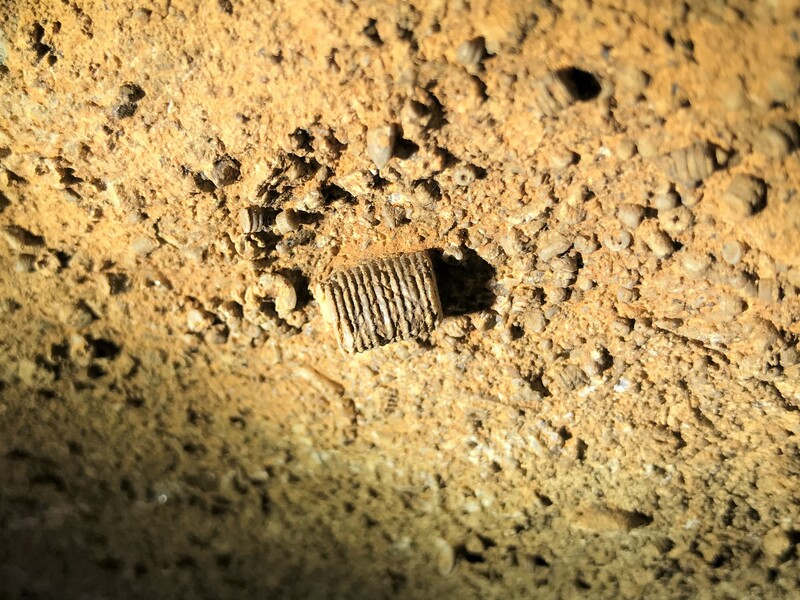 After a few minutes of internet searching followed by a few hours of electrical and mechanical troubleshooting, I was ready to call in the RV Repair Cavalry…but unfortunately, the nearby Mobile RV Service Technician who could get to me at some point tomorrow. Yep, another call to MWR to beg for another extension, which they graciously provided. Cold, tired, and a bit frustrated I called it an afternoon and declared an Early Happy Hour. Tuesday, January 15, 2019: With a good night’s sleep and a hearty breakfast, I came to the realization to call the manufacturer of the leveling system, and to my surprise a real person answered, and transferred my call to a real technician! While on the line, he directed me to steps I had taken yesterday which I dutifully followed. Then he had me locate an “auto level control module” located somewhere on the centerline of the camper and affixed to an overhead horizonal structure. Apparently, the location of this module varies by trailer manufacture, so it took a bit to find in a storage compartment. Then, after removing half the contents from my basement storage, I noticed a bright shiny red 14-gauge wire dangling in midair and in close proximity to a ¼ inch stud marked with an “+”. Checking with a volt meter there was 12 VDC on the cable’s terminal so I reconnected the cable to the naked positive stud. After crawling out of the camper’s belly and pressing the retract button on the system touchpad I once again had full system operation…Eureka. Thanks Lippert Industries for the assistance! The rest of the day was spent relaxing and preparing for tomorrow mornings departure. 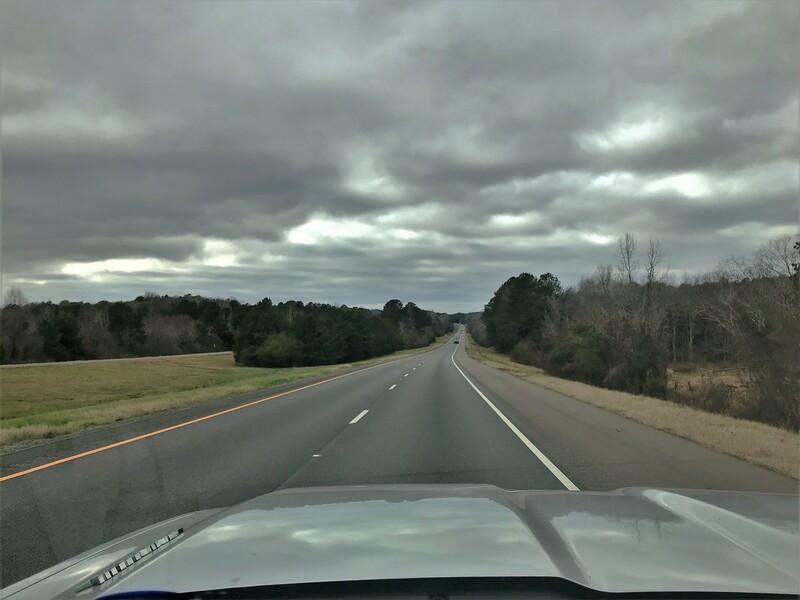 Wednesday, January 16, 2019: At 1130, we finally departed Redstone Arsenal and were on the road with a fully functioning truck and trailer. Found our way to Interstate 565 and headed southwest under darkening skies. Crossed the Tennessee River for the third time in a week as we headed for the city of Birmingham, Alabama. Why Birmingham? Well, my father was raised in that southern city during the depression years and had often talked of his experience growing up in the old south, so figured we would strop for a few days and poke around a bit. About two hours into today’s trip, Kit started looking for camping opportunities, and discovered an Alabama State Park about 30 miles north of the city that looked promising. Kit and I much prefer municipal, state, or national parks as not only are they typically in historic and scenic areas but are generally more rustic. In addition, they are frequently less pricy not having all the RV Resort frills we seldom use. 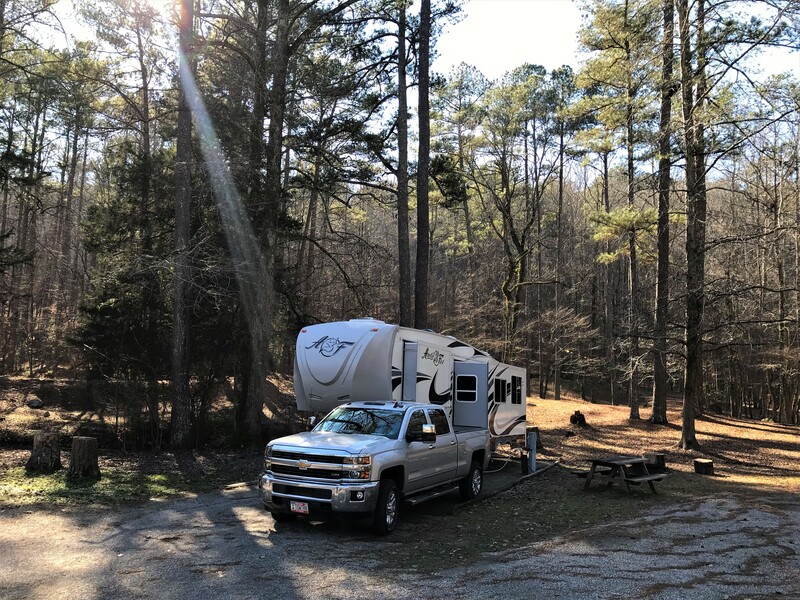 Kit called and they had ample room, so we set the trucks GPS for Rickwood Caverns State Park, pulled in, registered for four nights, and set up in a nicely wooded site. Spent the rest of the afternoon walking about the campground and going on a short hike into the neighborhood hillside. It’s nice to see some green vegetation on this warm winter afternoon. All along the well blazed trail were rocks with the distinctive erosion marks of swiftly flowing water. … which I hope to explore tomorrow! Thursday, January 17 through Saturday, January 19, 2019-Warrior, AL: Kit and I mainly spent the three-days here exploring the area. As mentioned, my father grew up in Birmingham which is just 30 miles to the south of where we are camping, and I’ve often wanted to revisit this historic city. Birmingham is, at over 200,000 folks, the most populous city in Alabama. Chartered in the late 18th century, it grew from a small agricultural region to a major industrial city following the discovery of Iron Ore and the corresponding laying of two intersecting railroad lines. The burgeoning steel production led to rapid growth and a large middle class…giving the city the nickname of “The Pittsburg of the South”. At the peak of prosperity, the Great Depression hit, and decimated Birmingham’s economy. More than 80% of the city’s residents became unemployed and “Hobo Villages” cropped up throughout the region. Fortunately, my grandfather was a lineman for the local telephone company so maintained part time employment being called in when the phone lines needed repair. Even with that, the family had a rough time making ends meet. Birmingham was rescued from this dismal situation by the advent of WWII and the need once again for American steel to support the war effort. A historical monument to the cities steel making heritage is a statue of Vulcan, the Roman God of Fire. 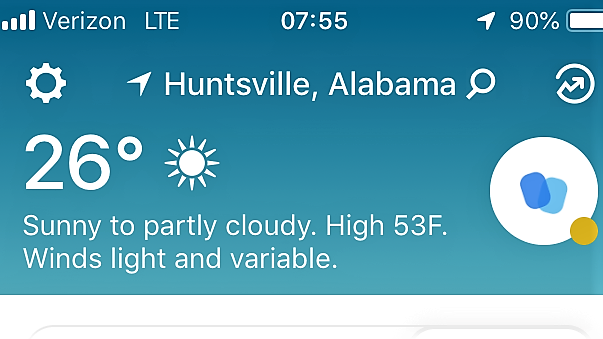 …while “mooning” the upscale enclave of Homewood, Alabama to the west! 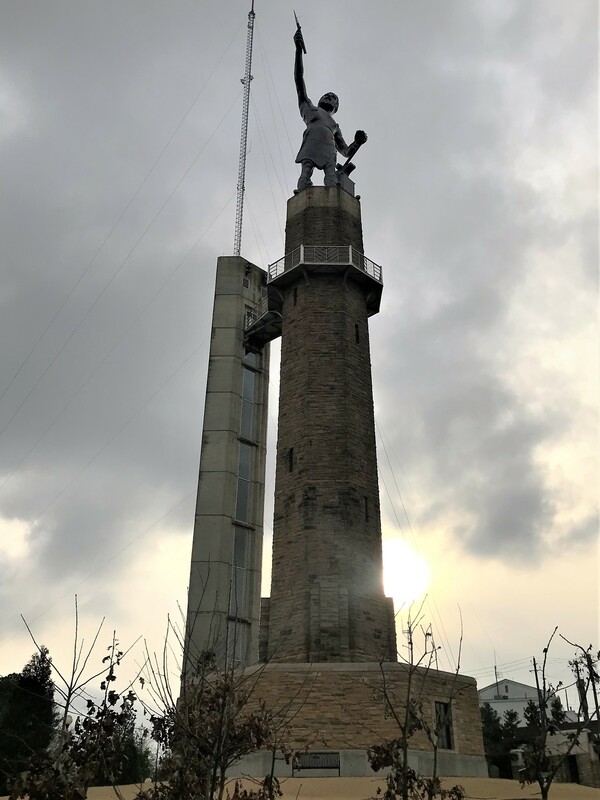 The “Iron Man” is 56 feet tall and stands on a 124-foot pedestal which can be climbed by a set of stairs to an observation platform where panoramic views of the city can be enjoyed. 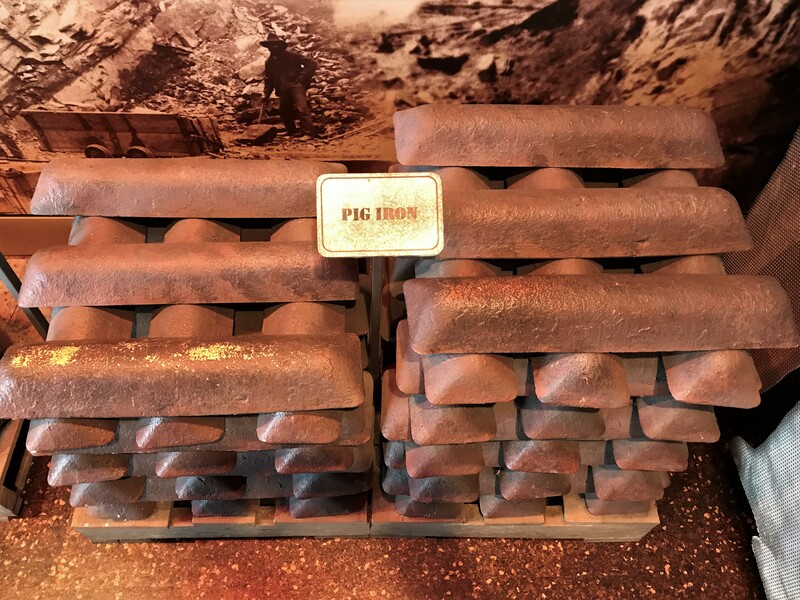 …ingots of raw steel that received their name as they resembled piglets. This product of Birmingham was shipped worldwide for use in manufacturing various steel products. 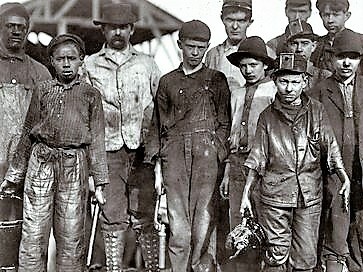 The boys and men working in the iron ore mines were primarily recently arrived immigrants or African Americans…some of whom were leased to the mine owners by the city while incarcerated in the municipal jails. 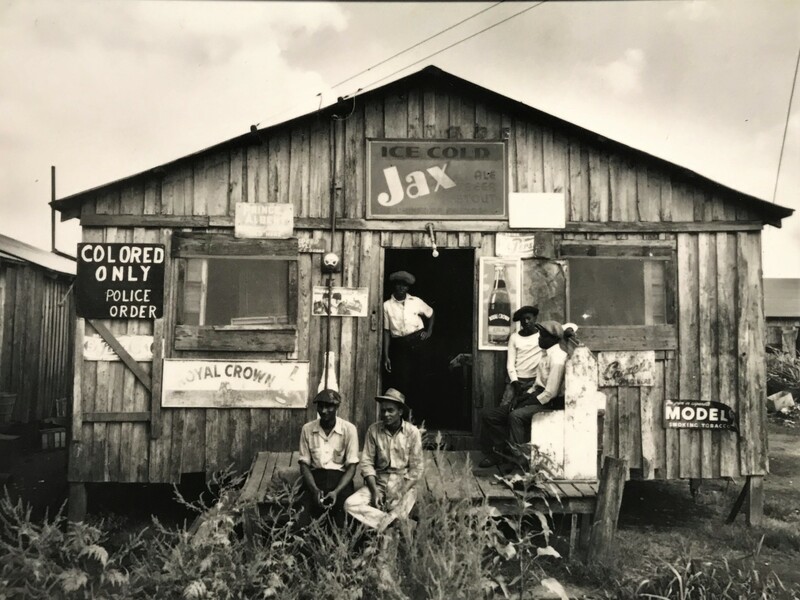 In those days, a charge of vagrancy was enough to be locked up and subject to forced labor in the mines…a common tactic in the segregated south. 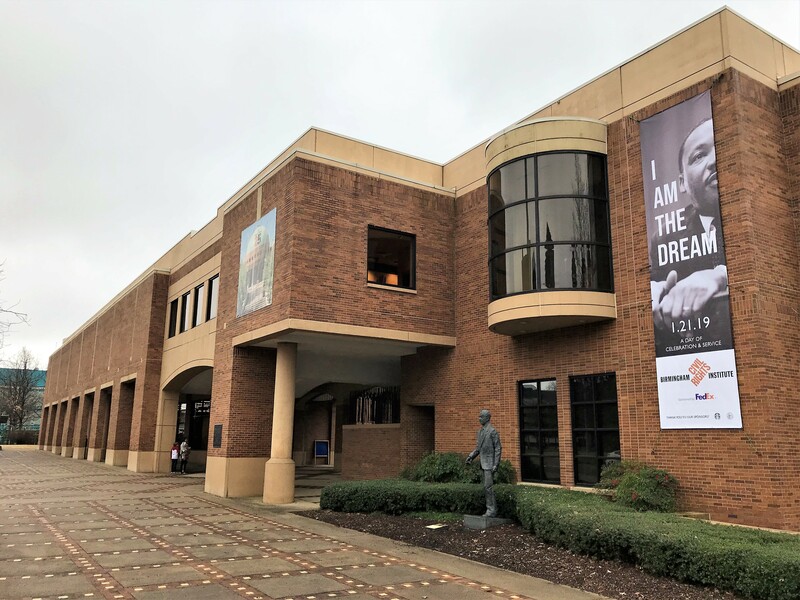 Another Birmingham attraction we chose to visit was the Civil Rights Institute. 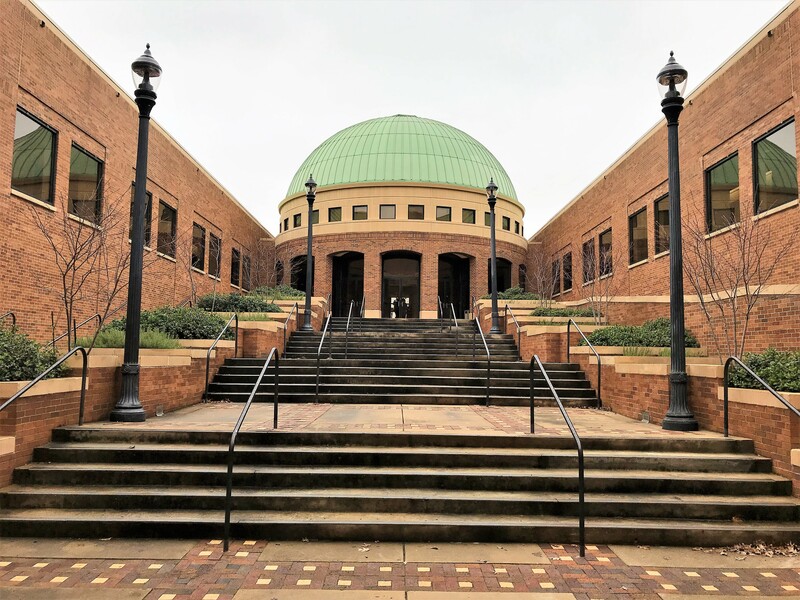 Opened in November 1992 and designated a National Monument in 2017, the institute is dedicated to the collecting and preservation of Civil Rights Documents and Artifacts. Contained within the Institute is a museum depicting the struggle to eradicate segregation and improve race relations in this vibrant city. Following the Civil War and during reconstruction, racial prejudice and discrimination was rampant. The buzzword of the times was “separate but equal”. The local and state laws required separation of the races but rarely were the facilities equal. Kit and I came across a pair of drinking fountains similar to the above in Shreveport, Louisiana while on our move to Key West in the mid 1960’s. 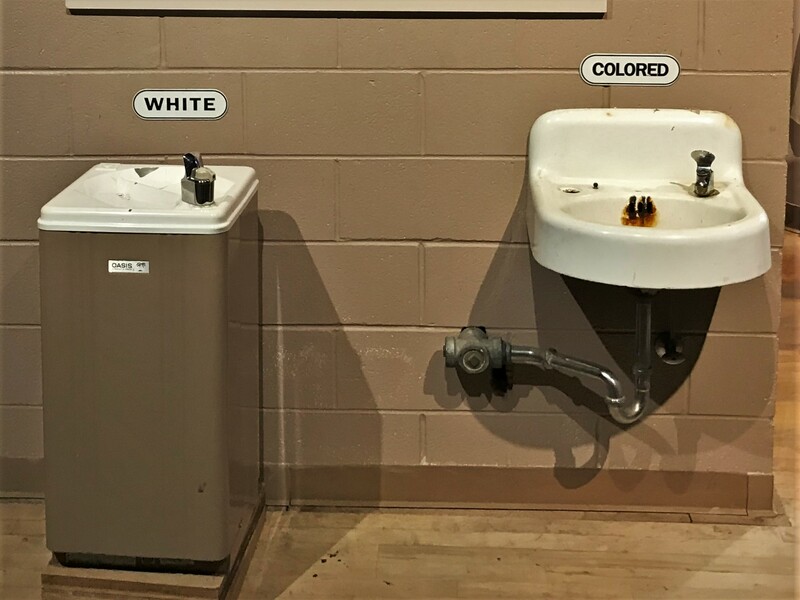 The sight of these separate but unequal drinking fountains were confusing to us California kids who grew up in a culturally diverse neighborhood. The black folks created their own communities and culture trying to abide by the Alabama State laws. 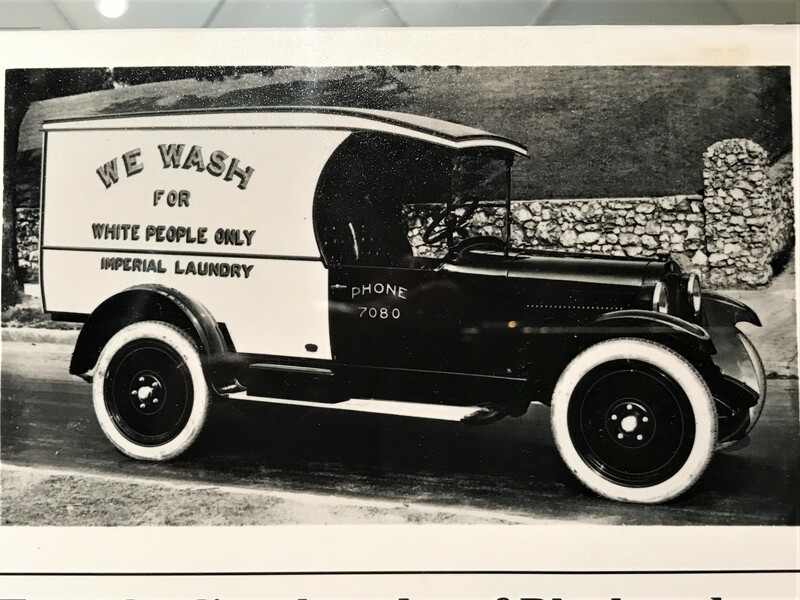 Black-White separation extended to services as common as hospitals, schools, funeral parlors, and even laundries. During this era, a secret order of extreme separationist grew in the city and attempted to terrorize the black population. 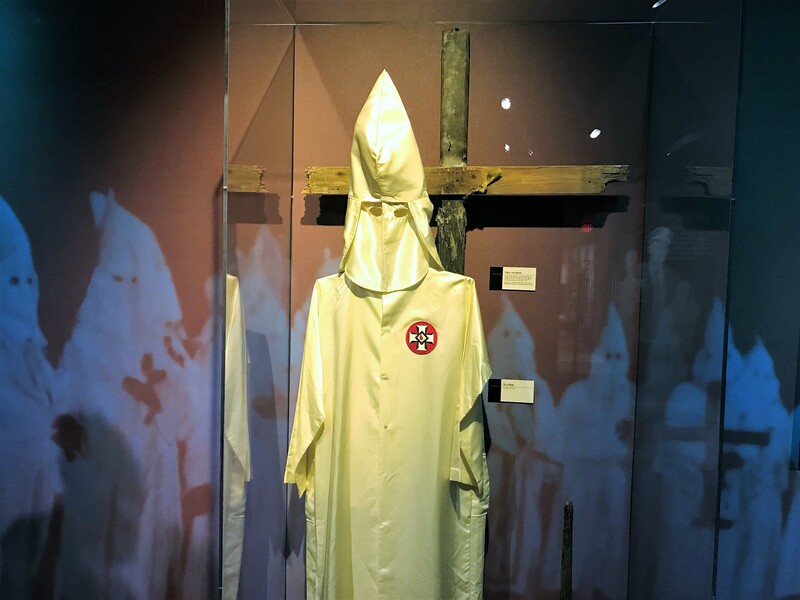 The above museum artifacts were used in a Klan initiated intimidation campaign in the early 1970’s. The charred cross was donated by the FBI and the Klan Costume was donated by an anonymous Klansman. African American churches served as meeting places for discussing and planning anti-segregation marches and other civil rights actions. 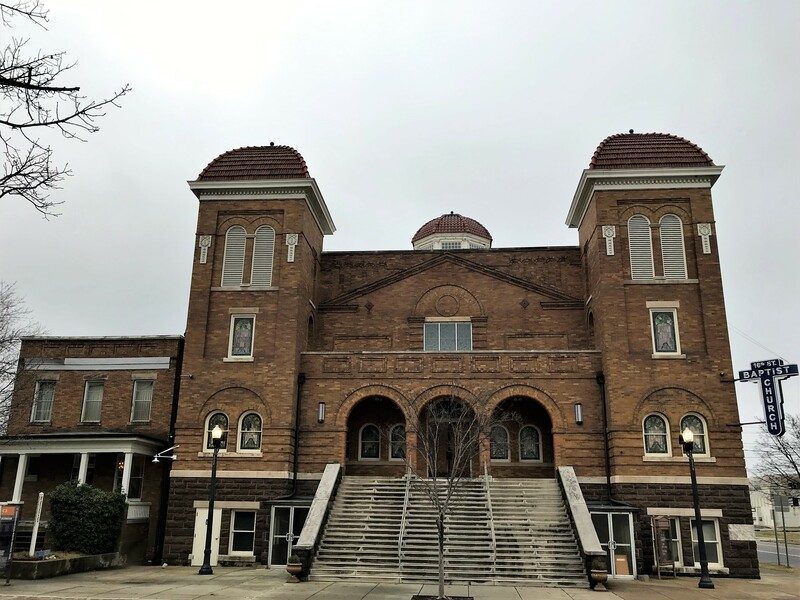 As such, from the late 1940’s to the mid 1960’s there were 50 racially motivated church bombings in Birmingham, including the notorious explosion at the 16th Street Baptist church on Sunday morning, September 15, 1963. 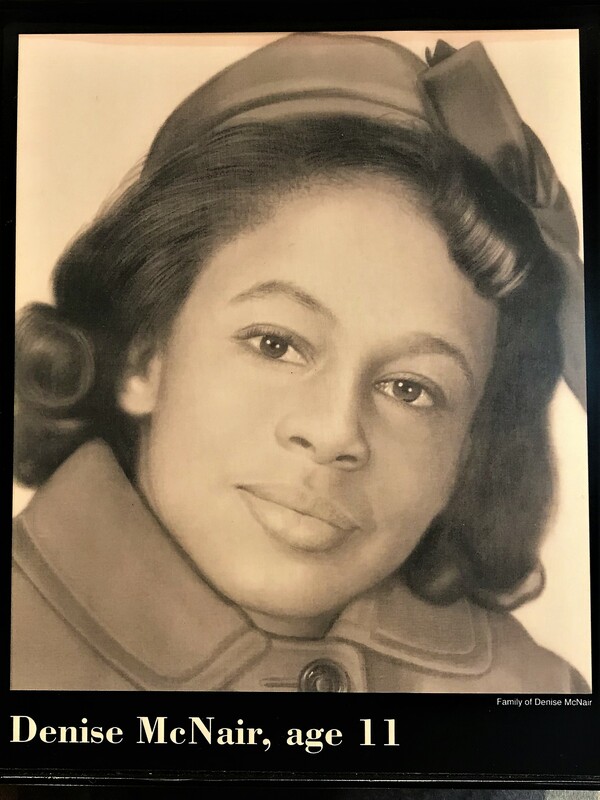 This act of domestic terrorism, against an African American church, and at the time of morning services, killed 4 young girls and injured 22 additional parishioners…one of the casualties of this heinous act was eleven-year-old Denise McNair. 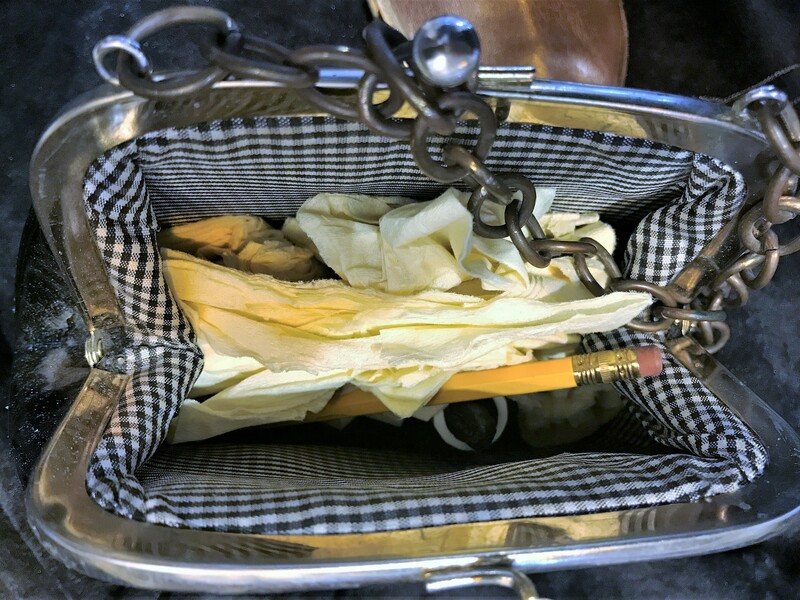 And one of the more poignant artifacts in the museum is young Denise’s pocketbook with her personal property still enclosed including a small bible. As a side note, former Secretary of State Condoleezza Rice lived in Birmingham and was eight years old at the time of the bombing. She was a classmate and friend of Denise McNair but was attending services at her father’s church a few blocks away that fateful morning. A sad day in our nation’s history, and one that galvanized caring citizens to demand an end of race baiting, terrorism, and all laws thinly disguised as harmless municipal ordinances. As a result, this cruel and cowardly act resulted in a fundamental change brought about by caring and concerned Americans and helped lead to the passing of the Civil Rights Act of 1964. 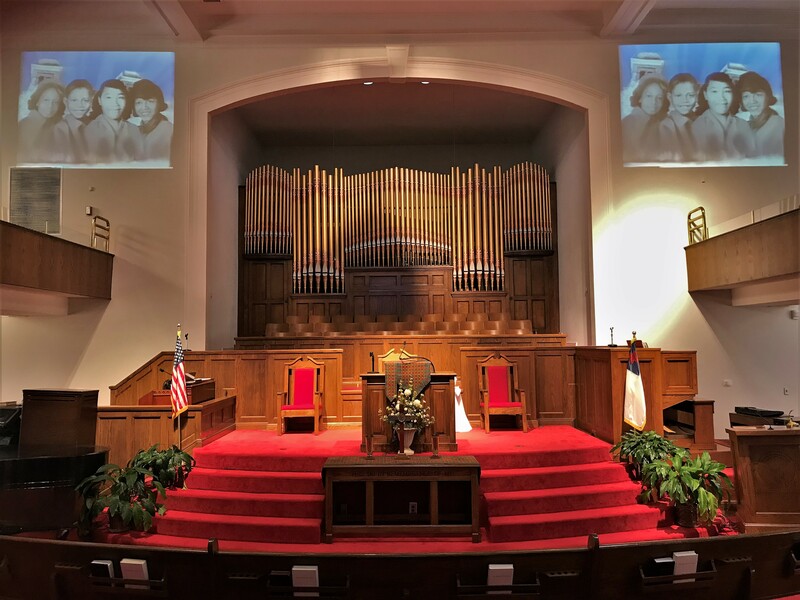 Located on the opposite corner from the Civil Rights Institute is the historic 16th Street Baptist Church. Which, following repairs from the bombing, was reopened and is in service to the congregation today. 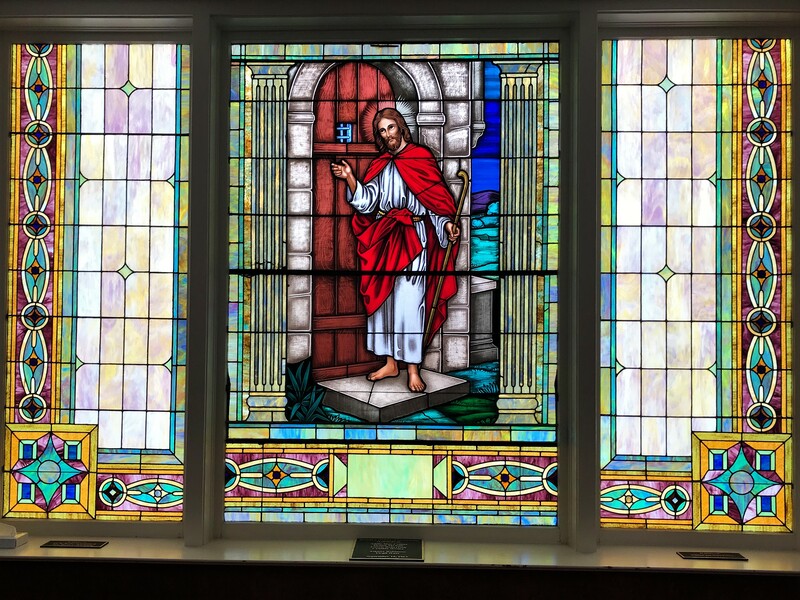 And as a part of the historic civil rights movement, the church is also open to the public. A short film about the bombing and its aftermath is shown in honor of the four young lives lost that day. A beautifully serene church and an institute of comfort to the parishioners some of who are on site to share their experiences and answer questions. A great day in a great city. 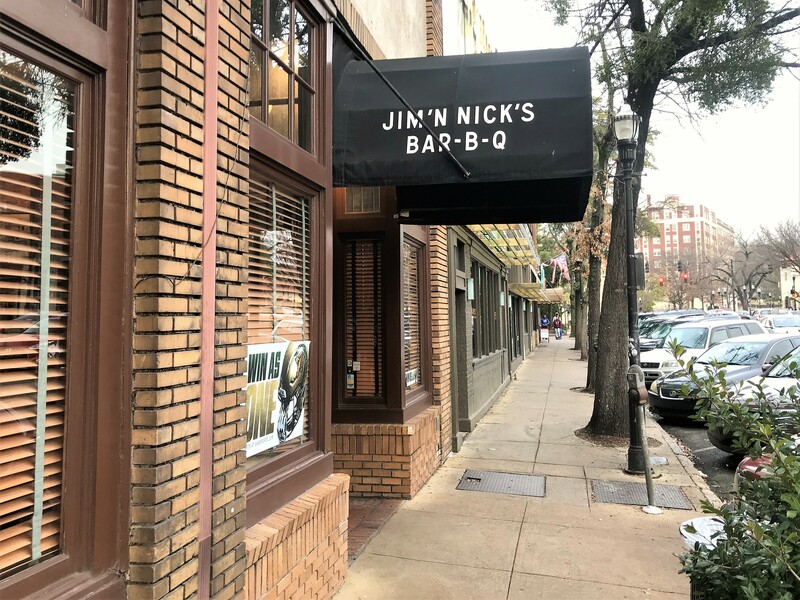 But now it was time for dinner, so on advice of a few locals we made our way to Jim ‘N Nick’s BAR-B-Q. 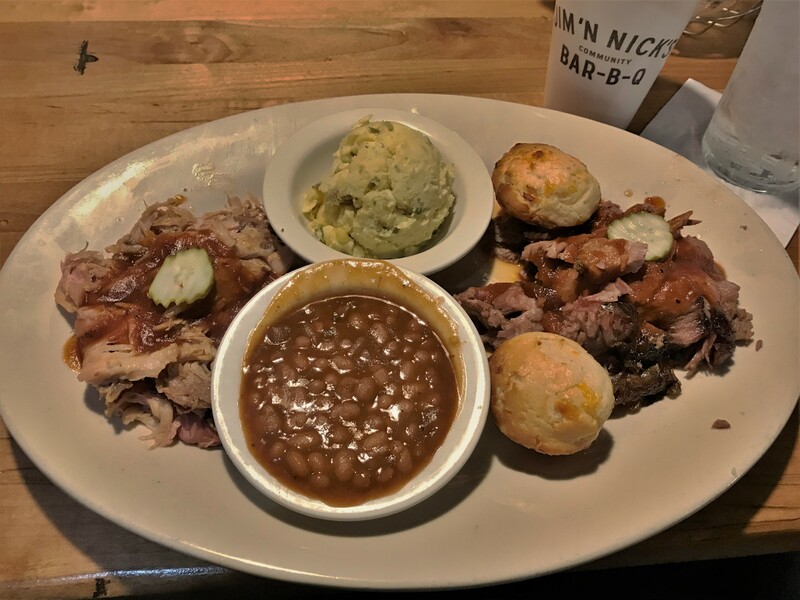 A cozy southern barbeque joint and a great place to talk and relax over a meal. 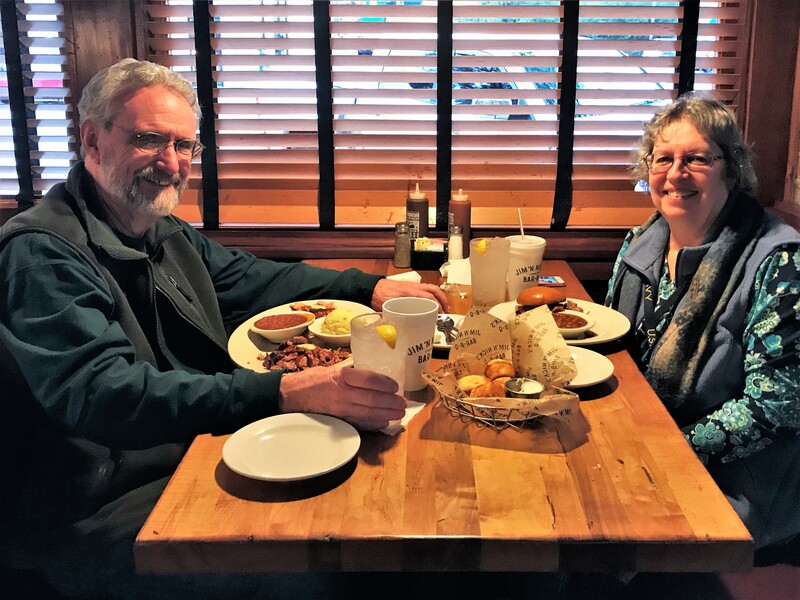 Over the years, Kit and I have enjoyed food in some of the nation’s most famous cities for barbeque and this place rates in our personal top five. The barbeque was moist and flavorful…and there was plenty of it! What a fantastic way to close out the day! 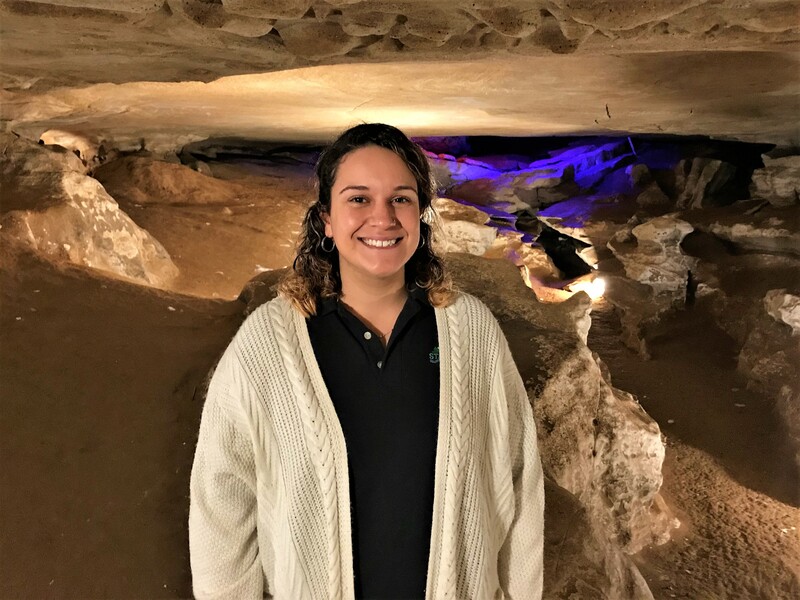 On yet another day during our stay at Rickwood Caverns State Park I decided to tour the namesake cave while Kit enjoyed some quiet “Kit Time”. 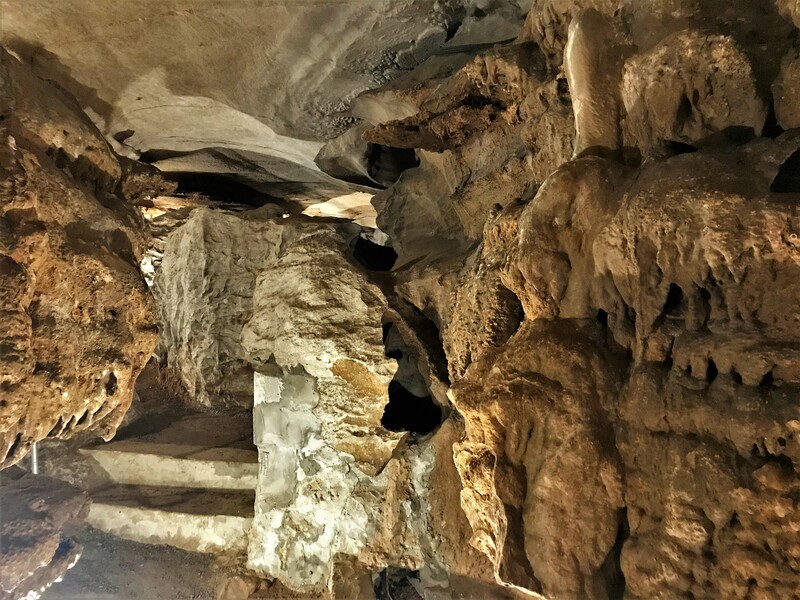 The cave is estimated to be over 300,000 years old and was created by water rushing through the limestone strata of the area. It was commercially developed in the mid 1960’s into a “show cave” by two gentlemen who bought the property then used a contraction of their names to form the word “Rickwood”. 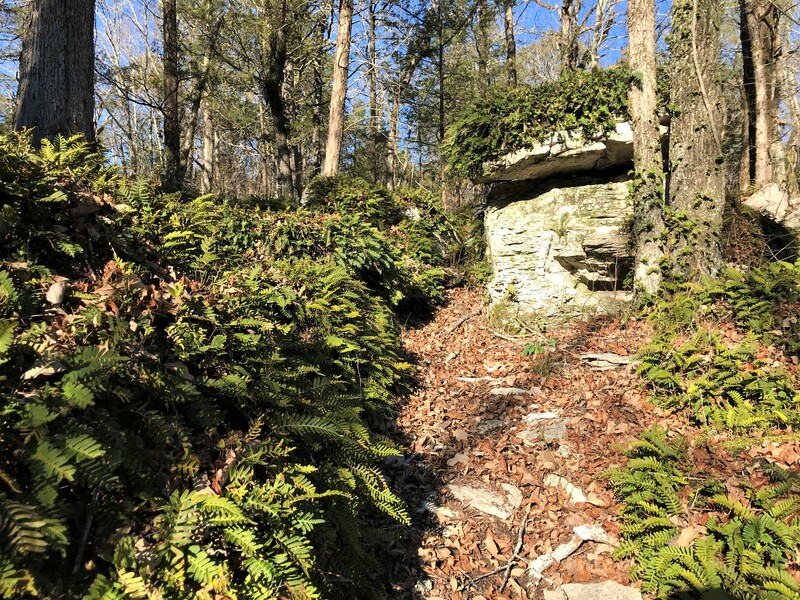 One of the men was the local Boy Scout leader and as a scout project pressed his troop into service to explore, excavate, and create safe access and trails for the anticipated paying public. 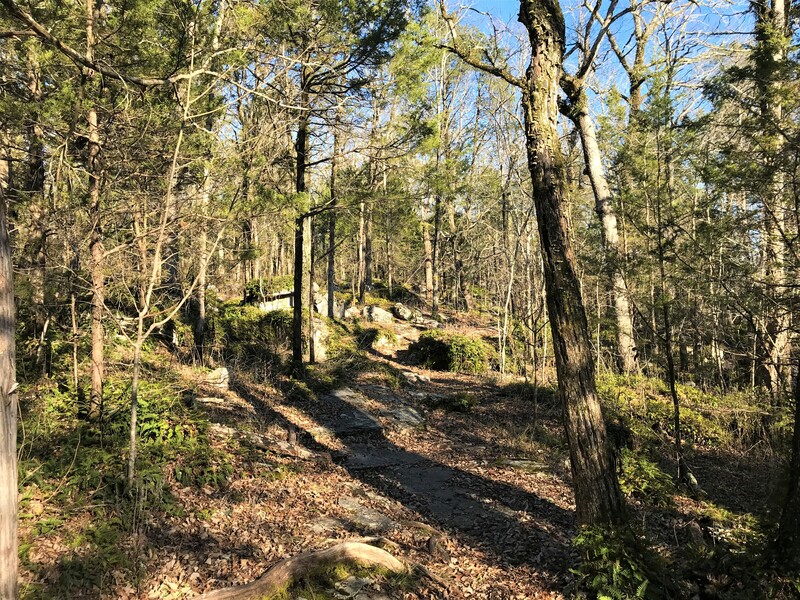 Years later, the land and cave were purchased by the State of Alabama and a state park was created. My tour guide was a delightful young lady by the name of Anizia. And I was her only customer for the tour so enjoyed a personal and more in-depth tour. 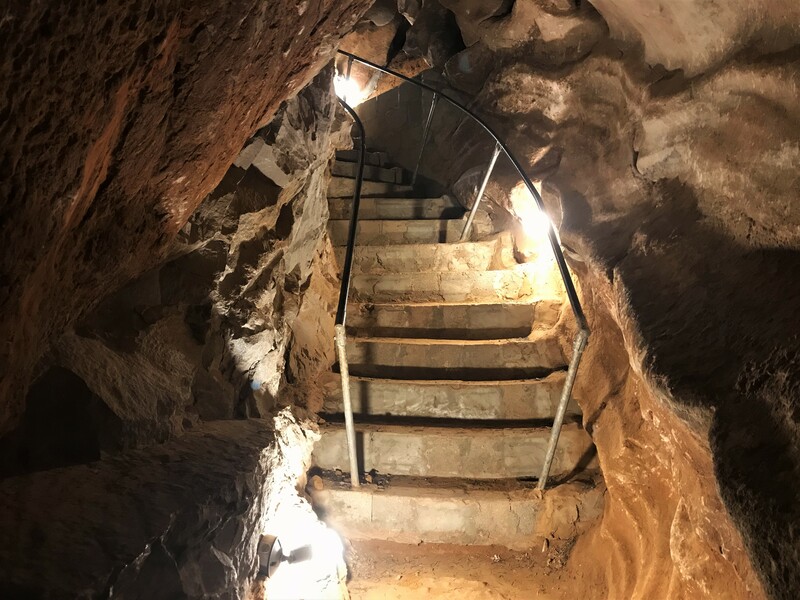 In order to gain access to the best part of the cave, the Boy Scouts hand-built stairs and installed steel handrails. These improvements constructed over fifty years ago are still in service today! In order to gain access to other parts of the cave, the scouts had to blast tons of rock using dynamite…try using youngsters to do that today! 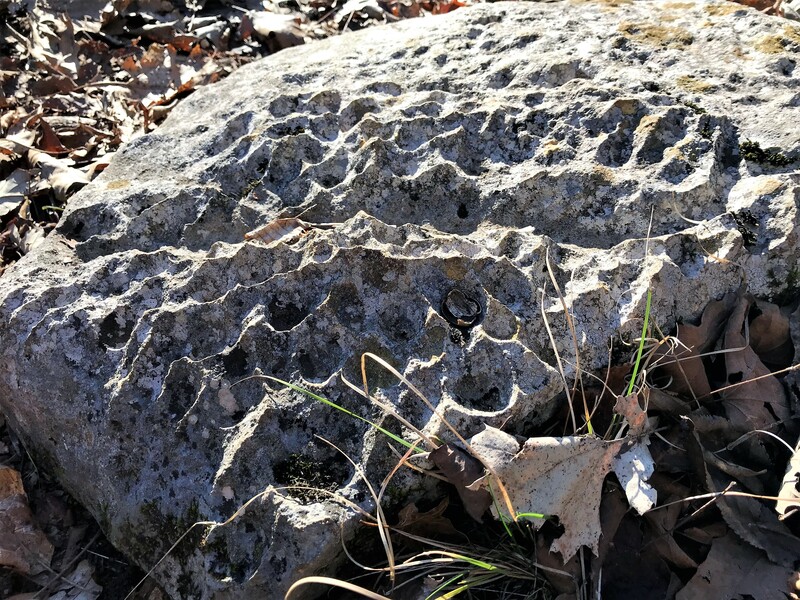 Then, rather than haul all this material to the surface, they used the excavated aggregate to create rock walls and barriers. 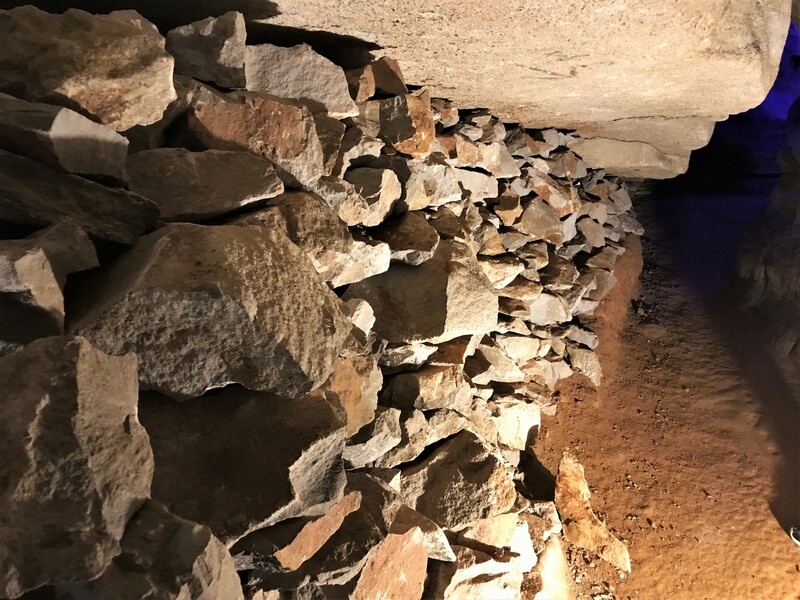 Their excavation efforts were well worth the trouble as it opened the most spectacular parts of the cave. 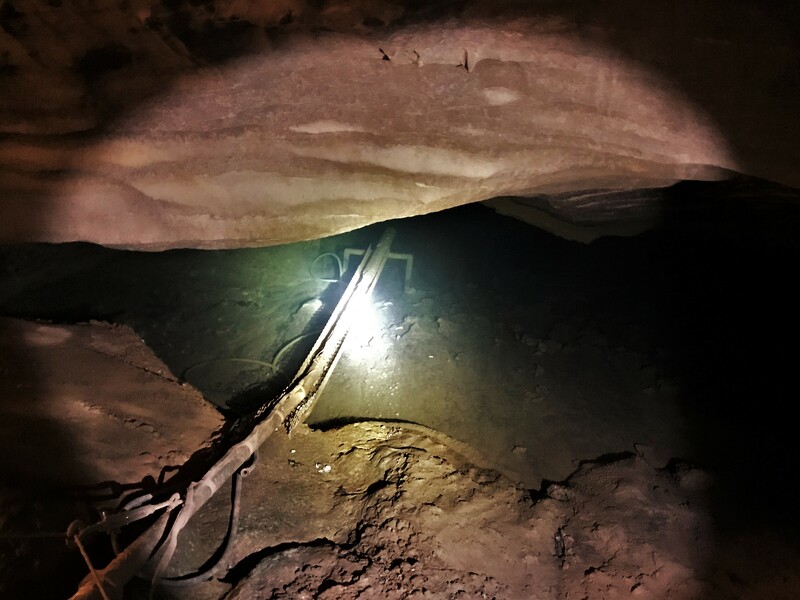 …which is still flowing today in the deepest parts of the cave. The pipe you see in the photo above provides cool, clean water to the surface for the state parks use…primarily as a source to fill the parks swimming pool in the summer. Pretty creative! 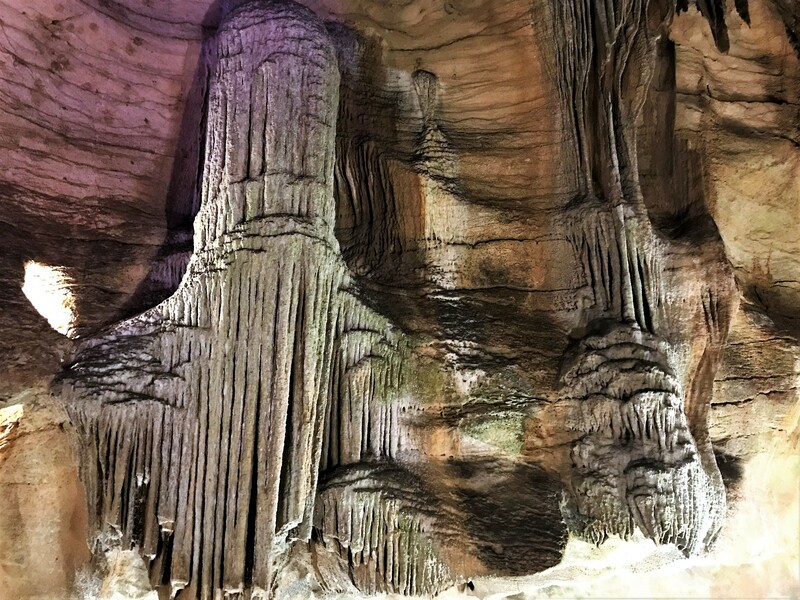 Rickwood Caverns is a live cave. 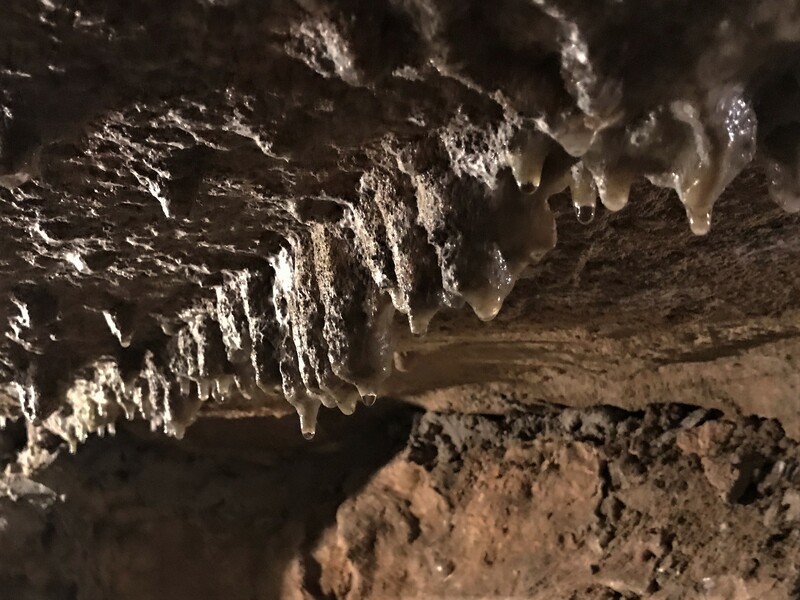 In that, surface water is still percolating through the ground and dripping from the caves ceiling which continues to create the stalactites, stalagmites, and other cave formations. The below photo appears to be inserted into the journal upside down. But I assure you that the perception is an optical illusion brought about by the cave dripping water from the ceiling over thousands of years and the subterranean river eroding the ceiling. 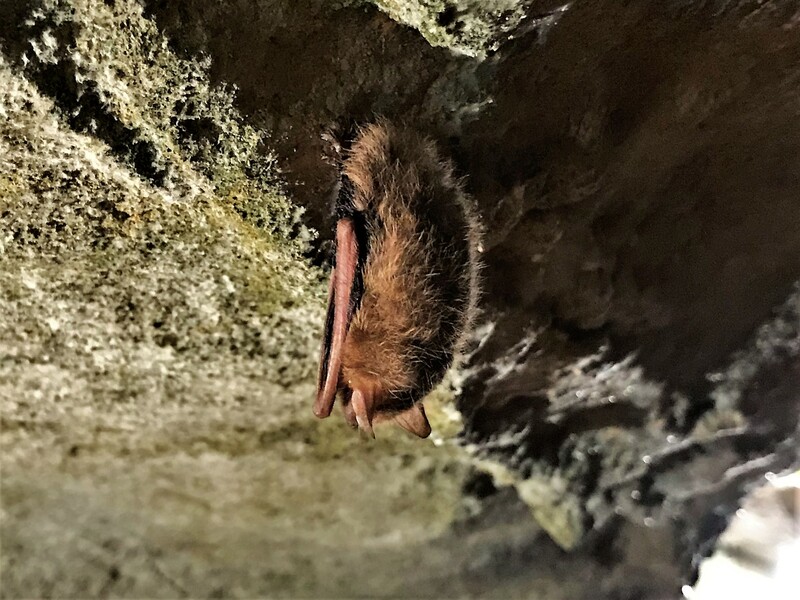 Speaking of ceilings, they provide the perfect perch for the many bats that call this cave home…such as this cute little fellow. 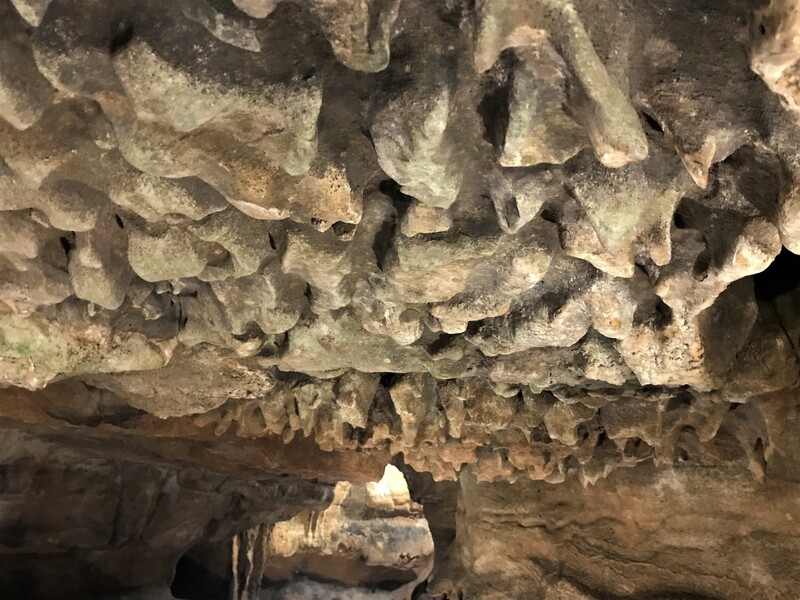 There were other critters and marine life in the cave thousands of years ago as evident by the many fossils protruding from the cave walls. 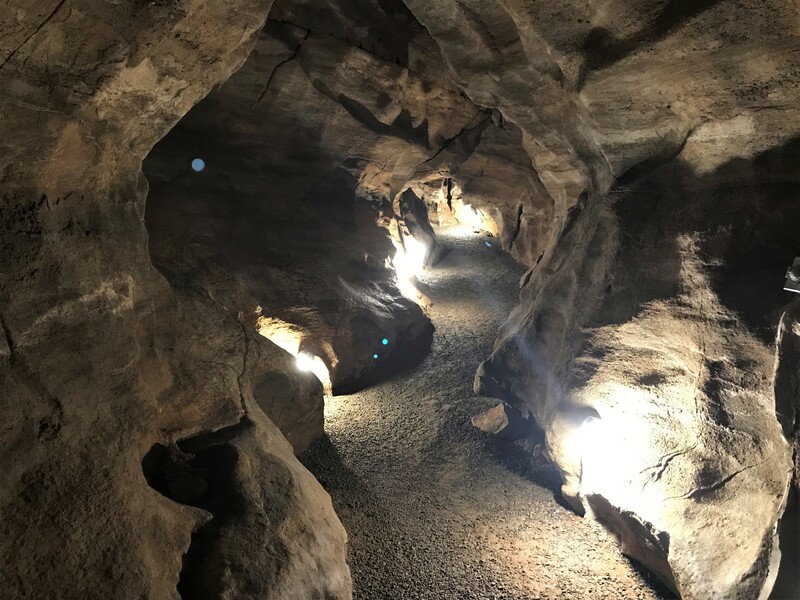 And evidence of early man visiting and possibly living in the cave is documented by various primitive tools and other artifacts discovered and displayed in cases at the state parks’ interruptive center. Some of the passageways required some stooping and bending to navigate. And others were an easy stroll. 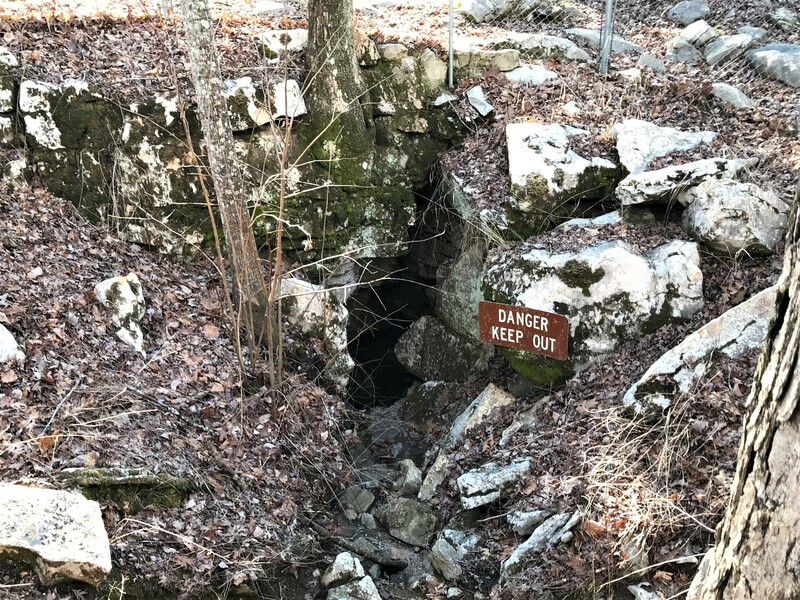 A little-known fact was that during the cold war period, Rickwood Caverns became a designated fallout shelter and tons of civil defense food, water and other materials were stored in an area of the cave out of sight of the tourists. 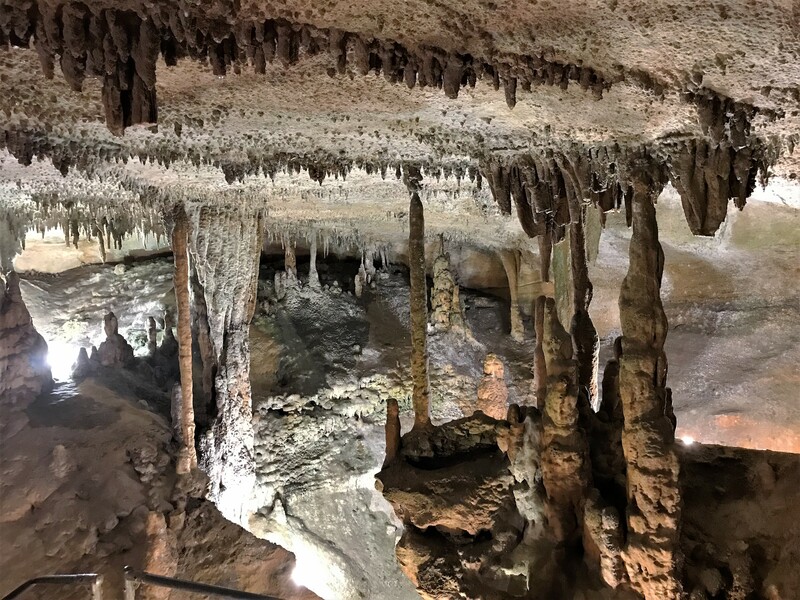 During our past Excellent Adventure trips, I have toured dozens of caves, including the biggies, Carlsbad Caverns in New Mexico and Mammoth Cave in Kentucky and I can safely say that Rickwood caverns is the second finest state-owned show cave that I’ve visited, falling just behind Kartchner Caverns in Arizona. 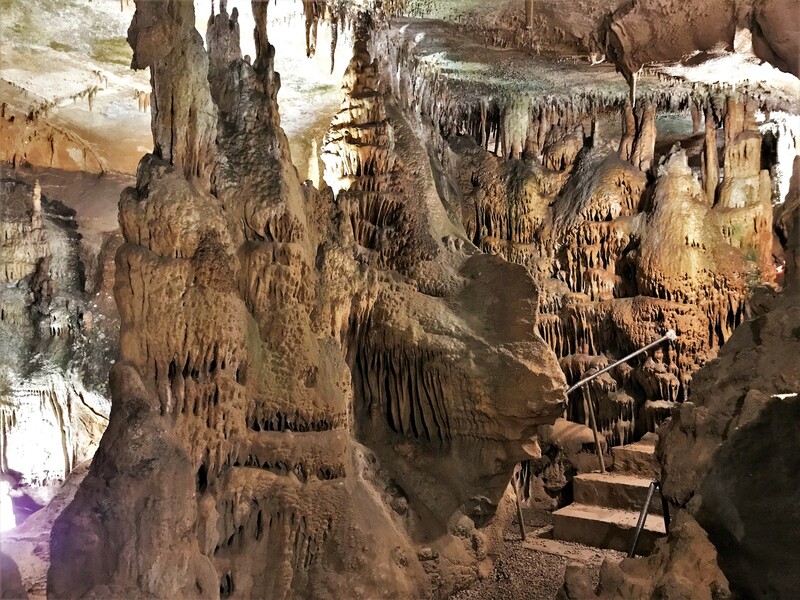 If you’re anywhere near this area, treat yourself to an enjoyable tour of a fantastic cave. Returning to the camper cold and hungry, an incredible smell greeted me as I opened the door. 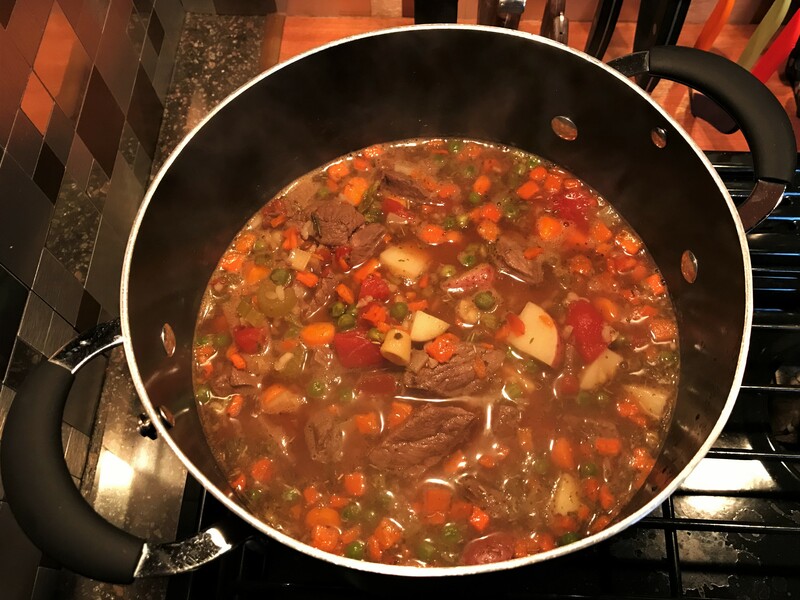 Kit had made one of her signature pots of soup and it was delicious! Since my father’s people grew up in the Birmingham area it stood to reason that some of our relatives would still reside in the area. Due to Kit’s computer sleuthing, she discovered a cousin that we had not seen since 1975. 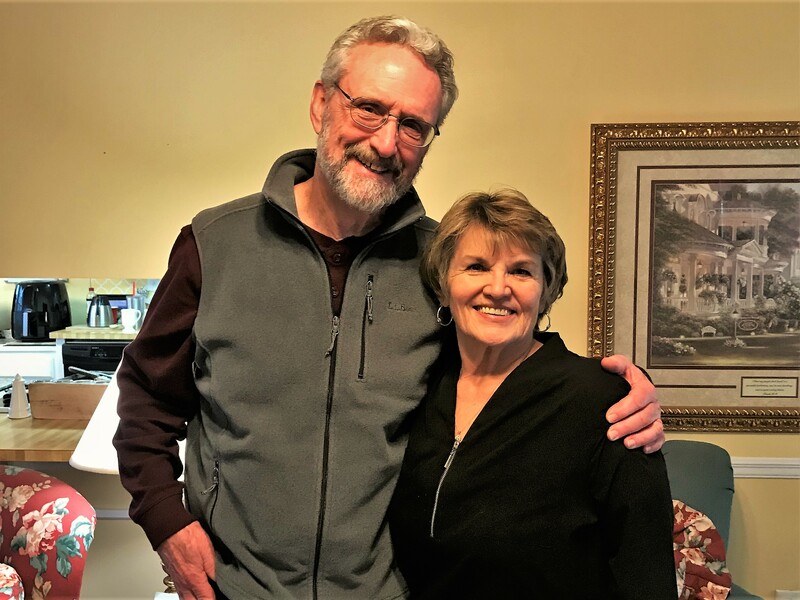 Cousin Sandy, and her husband Vern reside a mere five miles from where we are camped and graciously invited us over for an afternoon of conversation, apple pie, and coffee. What a great time reconnecting, reminiscing, and catching up on the past forty-four years…Thanks folks! Well, that’s it from Birmingham, tomorrow we head south…or west…or east! Stay tuned!! 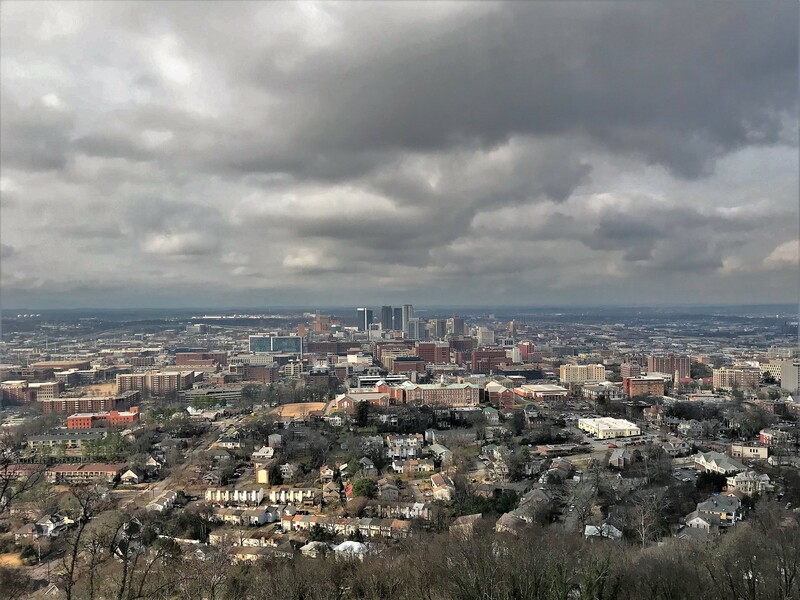 Kit’s Bit’s: It was great to finally spend some time in Birmingham. Seems we’re always in a hurry to get “somewhere” and never took the time to explore this area. I thoroughly enjoyed seeing the Civil Rights Museum. From news reports between the 60’s up to the 90’s, I remembered many of the incidents that were portrayed at the museum. Also, I enjoyed visiting the 16th Street Baptist Church, right across the street. There was a large group of students there and the Docent was discussing many of the events that had taken place there. The best part of our stop here was reuniting with Bill’s cousin Sandy and her husband Vern. We had visited Sandy and her family during our cross-country trip (due to USN transfer from San Diego to Norfolk) in 1975, then, lost track of them. It took many years to finally catch up with her! We had a delightful afternoon! Thanks, Sandy & Vern! Thanks, as usual, for your nice comments. If we’ve learned anything after many years of RVing, its to expect the unexpected and just roll with it! Birmingham sounds like a fascinating city. We drove through it, and I think spent a night, way back when we were headed to Barb and Harv’s on our 25th anniversary trip, but didn’t see anything. Maybe we can go back sometime. 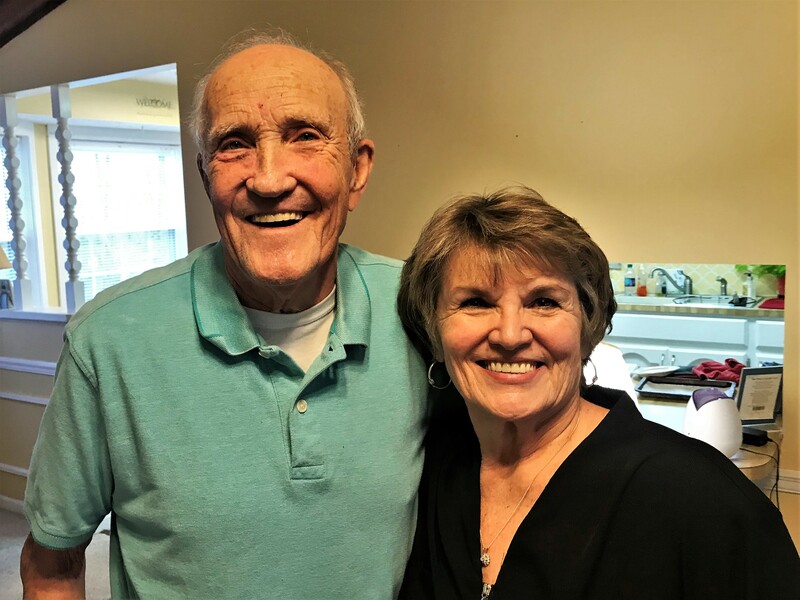 Glad you were able to reconnect with Sandy and Vern. It’s so great to see someone again after so many years. Just reconnected on FB with a coworker from 1958 and she’s coming to her brother’s down here in a couple of weeks and we’re going to get together. Looking forward to the next chapter in your journey. Love you guys. Enjoy. Hi folks, yep…Birmingham is indeed an interesting and historic city. Hope all is well with you…we are in good health and currently laying over in South Texas before slowly meandering easterly. Lets stay in touch…who knows, we may be able to connect at some point. Thanks for the nice comment. We are in South Texas and this is probably as far west as we will travel this year…want to further explore the southeast before heading home. Take care, think spring! As always, I have enjoyed reading every word of your travels! As Bob and I are still in Maine on this cold Saturday morning, it is with so much excitement to read where your travels are taking you this year and what discoveries you have made! Our travels will have to wait until springtime when we head to Florida! Safe travels and keep writing about your adventures! Hi, great to hear from you, and thanks for the nice comments. We are currently in South Texas and after a few weeks exploring this area will slowly meander to the east coast, and then make an even slower meander up the eastern seaboard. Hope to see you folks at some point this spring/summer/fall! When I taught 3rd grade I’d always read the book to my kidsThe Watson’s Go To Birmingham…it would be a quick ,easy , interesting read for you on the road! Enjoy reading your musings😘safe travels! Hi Mel, great to hear from you…thanks for the nice comments and for the tip on the book about Birmingham. I’ve just downloaded it on my Kindle and look forward to its reading. With my 3rd grade personality, coupled with my 3rd grade reading comprehension and added to my new interest in the south, it’s a win/win/win! Take care and please tell our Sage friends we said hi! 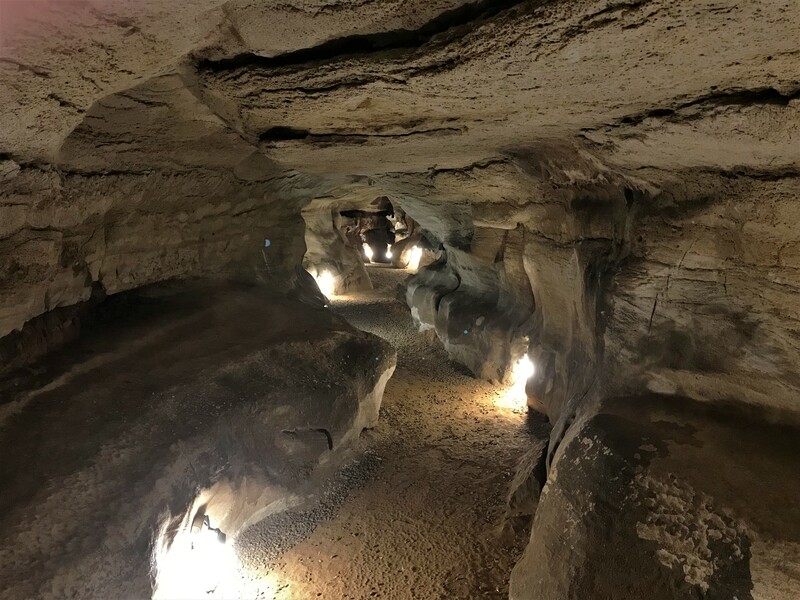 QUITE THE INTERESTING STORY ABOUT THE CAVES AND HOW THE BOY SCOUTS WERE USED TO BLAST AND BUILD STEPS ETC. I HOPE THEY WERE RENUMERATED. NICE WEATHER HERE, SNOW ALL MELTED BUT SOME DANGEROUS ICE TO WALK ON!’ BE SAFE AND WARM! 30 HERE NOW! Hi folks, hope all is well…we are doing fine and currently in South Texas which is the furthest west we intend to travel this year. Going to spend the next few months exploring the Southeast before meandering home in the spring. Take care! I had just saw a movie on you tube and the movie is called “The Watson’s go to Birmingham” (just search that) and it is all about the stuff that you talked about, the movie is set in 1963 and and this family went to a church in Birmingham and the people bombed the church but aside from that it is a great movie. Thanks for leaving a comment on our travel website…what a pleasant surprise! I did Google The Watson’s go to Birmingham and discovered a book as well so downloaded it to my Kindle. Hope you and your family are happy, in good health, and doing fine. We are looking forward to your visit in Maine this summer! Bill and Kit: Fascinating stories. I have not been to any of those places. Would especially love to visit the Civil Rights Institute and the Rickwood Caverns. If you want to skip winter weather, better stay out of Maine a while longer. It is snowing here again. Hi Jym, thanks for the comment and kind words…means a lot coming from a wordsmith such as yourself. Looks as if you folks have once again enjoyed a great travel adventure, can’t wait to see more of your photos!